We've always had a long-term vision of the smart home as a kind of tracy island, where the front lawn ﬂips over to reveal the landing pad for our hover car, and a helpful android follows us between the holodeck and the teleport with a tray of luminous green drinks. Frustratingly, it doesn't look like the Thunderbirds, or Jetsons, scenarios which are both set at the beginning of the 2060s, are going to happen quite as their creators imagined. in fact, it seems we can't even let go of the internal combustion engine from the 1860s. however, the smart home is currently enjoying a renaissance thanks to two inventions futurologists of the past missed completely. the prevalence of robust broadband and the power of the smartphone have together enabled us to cast off the Cat-5 cable and crestron remote controls that were once considered essential for smart-home installations, and cut straight to the connected home 2.0. it's here that the internet of things is democratising home automation, by uniting our everyday appliances with Wi-Fi and Bluetooth, and handing us complete control through free smartphone apps. It turns out that the supercomputer in your pocket is the ideal touchscreen interface for monitoring every aspect of your smart home, and it's powering a revolution in smart-home innovation. so where is this tech taking us? From the buzz around the iot at this year's CES gadget-fest, it seems anything is possible. from virtual-reality exercise machines to connected kitchen appliances and smart security systems, there are very few household devices left that aren't beginning to benefit from a network connection. taken on a room-by-room basis, it's a little easier to work out where the smart home is heading in the next few years. To get into our future home, we'll be opening some kind of keyless door- entry system. there are already bluetooth smart locks available – from both start-ups such as august and established locksmiths including Yale – that let you use your phone, or bluetooth key fob, to unlock the door. and soon, we'll be using wearable tech to trigger the mechanism when we're in proximity. meanwhile, biometric locks that recognise our fingerprints will also become widely available once we overcome our inherent distrust of technology. we shouldn't be surprised to find the door being opened by a telepresence robot, driven by the absent homeowner and speaking with their voice over Skype. This could solve the problem of those damn daytime deliveries you keep missing. fully autonomous robots, that can take it upon themselves to open the door and understand the situation, are a little further away, but you can bet that they're coming too. these personal-assistant 'bots will know you intimately from your social-networking posts and online browsing habits, and will know when you're heading home by geolocating your phone. if robo-Jeeves isn't opening the door with your slippers in hand when you return from work, then technology is failing us. As for answering the door yourself, it'll quickly become normal to reach for your smartphone and greet your visitor through a video intercom with face-recognition software, before unlocking the door from the app. as you enter the smart house of tomorrow, sensors will trigger automated systems that were conserving energy while you were out as the security system disarms, the lights, the central heating, maybe a little background music, will all kick in to your preferred settings and playlists. the house will get to learn your habits and routines. as voice-recognition systems like Siri and Google Assistant evolve, we can expect to be barking orders at everything from the light switches to the thermostat and curtains. in fact, homekit gadgets are already using spoken siri commands to adjust your Philips hue lighting. Soon, you'll be able to program phrases like, “honey, i'm home!” to initiate a whole series of commands that might, for example, fire up your home cinema and switch it to your favourite channel. if the kitchen is the heart of the home, it's also where you tend to find a lot of low-tech kit – but not in our smart kitchen. manufacturers like Bosch, AEG and Whirlpool are all working on fully integrated systems that offer an alternative user interface on your phone. scrolling through preset cooking cycles is a lot easier with a touchscreen, especially when you're doing it from the couch in the living room. AEG has already accomplished this and fitted an internal camera so that you can check your dinner without actually getting up. The next ovens will be able to identify the meat you're cooking, set their own temperature cycles and decide when it's cooked. the connected kitchen will begin to make more sense when the oven, fridge, hob, taps, kettle and coffee machine are all working together in an integrated app, to ensure that your chores are all completed when you want and when energy costs are lowest. By contrast, the living room has always been at the bleeding edge of tech, and we're already seeing smart-home systems revolving around Apple TV, the Xbox One and Samsung's SmartThings. At some point, these incompatible platforms will come together – probably through third party bridging software to begin with, until a unifying standard is accepted. but while it's long been assumed that the tV forms a natural hub for the smart home, smartphone apps still offer a more convenient interface than the confounded tV remote. this is, of course, the thinking behind apple tV's app-driven entertainment and spoken siri interface, and it could yet point the way forward for all of us. 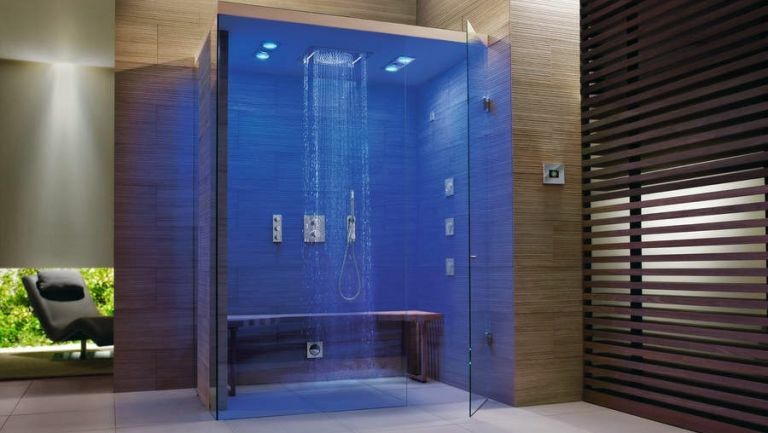 in the bathroom, sensors will be able to assess your health, tailor temperatures to individuals and promote water conservation by using steam in showers. bathroom mirrors will soon benefit from the development of low-energy, flexible OLEDscreens, where video can be wirelessly streamed from your smartphone via a one-touch NFC connection. Portable screens, which have already been demonstrated by LG, can be peeled off, rolled up and replaced on any convenient surface as you move about the house. in the garage of our smart house, you'll find an exercise machine with a difference. it comes with a VR headset that transports you into a gym – or, if you prefer, a jungle where your efforts propel you through a virtual world. Gyroscopes enable you to move in any direction, so you can climb, run or even fly your way to fitness. Just such a machine, called the icaros, is halfway there already and its launch is imminent. whatever the car of the future looks like, it probably won't hover and it certainly won't use fossil fuel, so a charging station for your electric car will be a useful garage gadget. ChargePoint already sells a wall-mounted unit that 'works with nest' to draw power from the grid when the rate is at its lowest, saving you big bucks in the long run, but this will eventually evolve into conductive charge points hidden in the floor that will draw power from your own solar cells and batteries built into walls. and how about a robot butler to watch over your smart house and welcome you home with a cheery, “what is thy bidding, master?” androids that are indistinguishable from humans still only exist in Hollywood but, rest assured, the boffins are working around the clock to fix this. Too many cooks spoil the broth, and nowhere is this saying more relevant than with the smart home. umpteen different companies supplying umpteen different products that use umpteen different methods of communication. it's a surprise we're getting anywhere with this home technology malarkey. while we wait for one standard to break through (our money's on works with nest, for the time being), an internet enabler app by the name of If This Then That is helping to bring all the services together, without the capitalist inconvenience of its own products to ram down people's throats; it's platform-agnostic, so it relies on the different brands to support it. IFTTT works by joining up different internet-connected devices – you just set the trigger and the resulting action. for example, you can join up two of its major supporters, nest and hue, so that when your nest thermostat is set to home, your Philips hue lights will turn on, like magic! the nest app home status is the trigger and the Philips hue lights are the action. alternatively, you could get your garage door to open using Garageio when you rock up in your connected BMW car using the bmw labs connected service. IFTTT has hundreds of services available, with more turning up all the time, so it's a great way of kicking off your smart home without having to buy into one ecosystem.